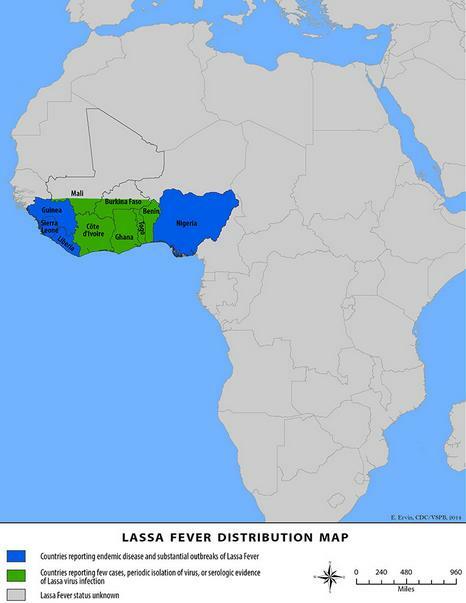 Lassa is a Viral Hemorrhagic Fever (VHF), similar to, but not as dangerous as Marburg or Ebola. The Lassa virus is commonly carried by multimammate rats, a local rodent that often likes to enter human dwellings. Exposure is typically through the urine or dried feces of infected rodents, and roughly 80% who are infected only experience mild symptoms. The overall mortality rate is believed to be in the 1%-2% range, although it runs much higher (15%-20%) among those sick enough to be hospitalized. Casual contact (including skin-to-skin contact without exchange of body fluids) does not spread Lassa virus. Person-to-person transmission is common in health care settings (called nosocomial transmission) where proper personal protective equipment (PPE) is not available or not used. Lassa virus may be spread in contaminated medical equipment, such as reused needles. For the past couple of months we've been following an outbreak of Lassa Fever in Nigeria, and last month the World Health Organization was notified of a similar outbreak in neighboring Benin. Earlier this week German media reported on a patient who died in a Cologne hospital from Lassa Fever after being evac'd from an undisclosed West African nation. 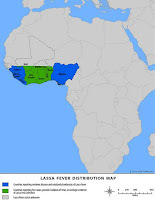 Today Emory University hospital - which safely treated Ebola cases in 2014 - has announced they expect to receive a suspected Lassa Fever patient from the African nation of Togo in the next day or so. First the statement from Emory, then I'll be back with a bit more. Emory University Hospital’s Serious Communicable Diseases Unit (SCDU) expects to receive a patient who may have Lassa fever. The patient’s diagnosis is not yet confirmed. Emory will work closely with the Centers for Disease Control and Prevention (CDC) and with the Georgia Department of Public Health in diagnosing the patient. Arrival time is not yet confirmed, however, the patient is expected to arrive via air transport this weekend. The patient, who due to confidentiality regulations cannot be identified, is an American physician assistant working for a missionary organization in Togo, West Africa. Emory was contacted by the U.S. State Department and asked to accept the patient in its SCDU, an isolation unit within the hospital in which four patients with Ebola virus disease were successfully treated in 2014. While still rare, we've seen a couple of recent occasions when Lassa Fever cases were hospitalized in the United States. Last year an infected traveler arrived in New Jersey, unaware he was infected, and subsequently died (see CDC Statement On Imported (Fatal) Case Of Lassa Fever – New Jersey). In 2014, in Minnesota: Rare Imported Case Of Lassa Fever, we saw another case where a traveler was diagnosed after arriving in the United States. In neither case - despite the initial lack of precautions - were any secondary infections reported. Unlike those cases, the patient now en route to Emory will arrive in full isolation, making the risks of infection negligible. While Lassa fever remains a relatively rare import, diseases such as measles, polio, dengue, malaria (and many others) remain a constant threat – even in places where they have been officially `eliminated’. And emerging diseases, like Chikungunya, Zika, H5N1, H7N9, or MERS-CoV can easily expand to new geographic regions through global travel and trade. As both the CDC and the World Health Organization continually remind us (see The Global Reach Of Infectious Disease), pathogens are excellent international travelers. Our only recourse, is to have plans to deal with them when they arrive, which was the topic of a 2015 TFAH Issue Brief: Preparing The United States For MERS-CoV & Other Emerging Infections.